Virtually everyone is familiar with aloe vera. It is considered the "queen of medicinal plants". Today, a vast number of products contain aloe vera. Therefore, it is not only the most well-known medicinal plant in the world but also the best-marketed plant. However, the use of aloe vera can be dated back to the first century. The aloe vera has been known for thousands of years. Evidence shows that the aloe vera was used 6000 years ago in Egypt. The Sumerians were well aware of the healing powers the plant possessed more than 4000 years ago. Since then the aloe vera has been repeatedly mentioned in traditional texts. It is not entirely clear from which country or region the plant stems from. It is probable that the aloe vera originates from the Arabian Peninsula. However, today it can be found in all tropical and subtropical regions of the world, where it is also cultivated. In many parts of the globe such as the Mediterranean area or India, the aloe vera has established a name for itself. The aloe vera has no stem and practically consists out of leaves only. These leaves grow up to 50 cm high and are approximately 7 cm wide. The aloe vera is covered in a layer of wax and tiny spikes or thorns are visible on the edges of the leaves. This is reminiscent of the cactus, yet has a similar appearance to that of an agave. Interestingly enough, it does not belong to either the cactus nor agrave species, but to the lily family. The aloe vera forms its own nutrients and stores these and the water they require to survive, in its leaves. There, inside the leaf, the active ingredients are embedded in a gel-like tissue. Nearly 200 different active ingredients are contained in the gel composition. The main ingredient is called polysaccharide acemannan, which is incorporated in human cell membranes, strengthening the organism, due to the positive effect it has on the immune system. Until puberty is reached, polysaccharide acemannan is produced by the body. Thereafter, it needs to be absorbed through food. Additionally, the plant is rich in vitamins, amino acids, minerals and enzymes. 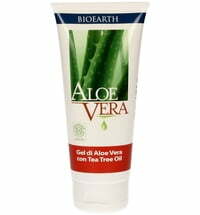 The slimy consistency of the aloe vera gel is quickly absorbed by the skin and was used for healing wounds and burns for centuries. The ingredients that make up the plant's composition is a real treat for the skin. 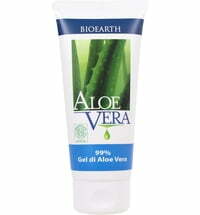 As such, aloe vera can be found in many beauty and cosmetic products. The aloe vera can also be consumed internally. It supports digestion and can also help ease constipation. However, caution should be exercised when ingesting aloe vera. An aloe vera overdose can cause serious side effects. It is therefore recommended to consult a doctor before ingesting aloe vera. 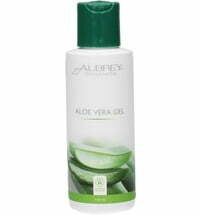 Here you will find an array of products that contain "aloe vera". Dragon's Blood Puffiness & Dark Circles Be Gone? !